This is a unique dish. Crunchy and creamy, it's Thai-ishly delicious! It has all the ingredients for a darn good Thai dinner. Coconut milk, lemongrass, basil, cilantro, red curry, lime juice, and mungbeans. The gang's all here! I wouldn't call kelp noodles a staple in our house. They're pretty spendy up here in The Last Frontier. These little translucent strands of goodness are chewy and almost crunchy if not soaked prior to use. They take on pretty much any flavor, like tofu would, and alone are completely flavorless. You know those tofu shirataki noodles, the ones that smell all rotten fishy? Ick. Not the kelp noodles, nope. Surprisingly enough though...you'd think if either one would smell it would definitely be the kelp noodles, but they don't. Yay! When I do splurge on them, I like to make something fun. Something bold, and something super delicious. Enter, Thai Coconut Curry with Kelp Noodles. I like to top mine with pan fried tempeh, fresh mung beans, and chopped cilantro, but you can top yours with whatever you want! This recipe has all the ingredients for a darn good Thai-a-licious dinner. 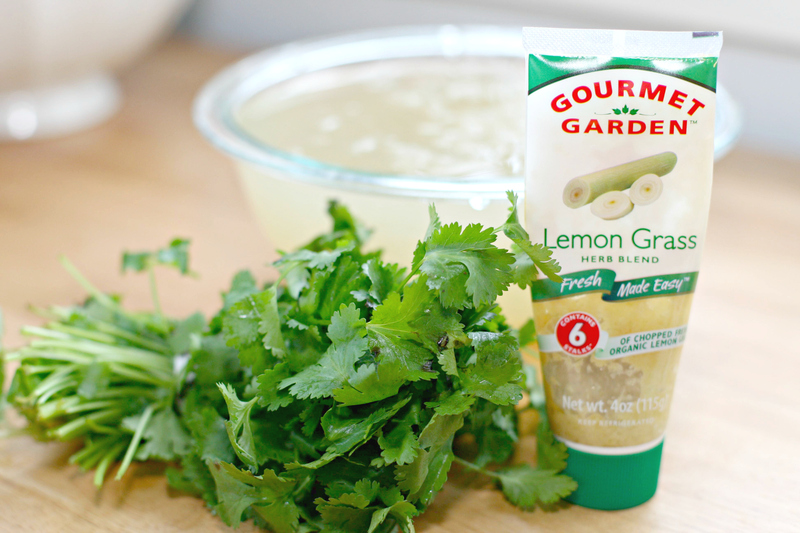 Coconut milk, lemongrass, basil, cilantro, red curry, lime juice, mung beans...yum! All that's missing is the fish sauce, but since we're vegan, we won't be missing it. 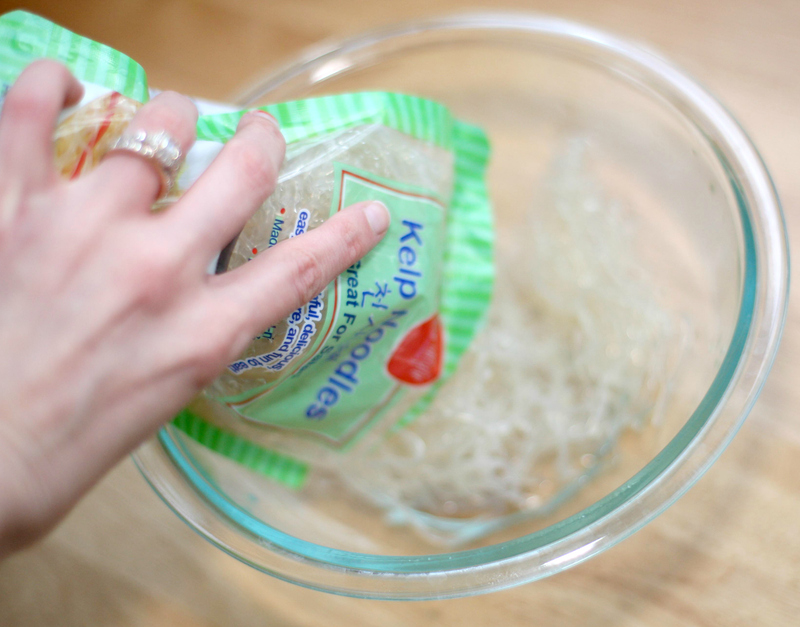 Rinse those kelp noodles and give them a good drain. Place them in a medium size bowl and bathe them in lukewarm water. Add the lime juice and massage them for a couple minutes. A bath and a massage...dang, I wanna be a kelp noodle! Let them soak for 20 minutes or so while preparing the sauce. If lime juice won't volunteer itself, go ahead and use lemon juice instead. What a rude lime. Don't omit the juice though, as the acid is important to help the noodles relax a little bit. And don't forget to massage a bit...spoil those little kelp noodles! Add all the sauce ingredients into a small saucepan and whisk to combine, over low heat. Don't allow it bubble. Slice the tempeh into small, thin bricks about the length of a thumb. Pour about 1 Tbsp. of prepared sauce into small frying pan along with coconut oil. Saute until tempeh is starts browning, about 5-10 minutes. Now that those pampered kelp noodles have had their day in the sun, drain them well and add the sauce to the bowl in which they were soaking and mix them up! Divide the sauced kelp into two bowls (or one if you're feeling especially ravenous), and top with the cooked tempeh, mung beans and chopped cilantro. Roasted garlic crunchies or some siracha would also be a great addition. The longer the curry sits, the better it gets, so go ahead and put it in a timeout if you want.